3. With wax paper on a cookie sheet, spread the melted chocolate out to any consistency. Place tray in freezer for a few minutes. 4. Pull tray out and spread coconut mixture on the soften chocolate. 5. Roll the chocolate over as you would rolling sushi. 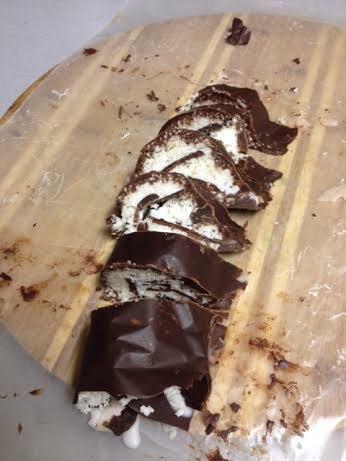 Slowly peel away the wax paper from chocolate layer as you gently roll the layers. This is the most difficult part. Depending on the temperature of the chocolate layer. Take your time either freezing it or leaving at room temp until it rolls up. 6. Wrap it up and place it back in the freezer. 7. When it’s firm pull it out, let sit for a minute then slice it up.